Now that Summer is in full swing, my parents and in-laws are coming to visit more often, my hubby and I are having friends over, and we are ready to throw fun Summertime parties. But, there was one problem in our home. Our bathroom. You never realize how plain your bathroom is until you see your dream bathroom, and you think to yourself, "Wow. 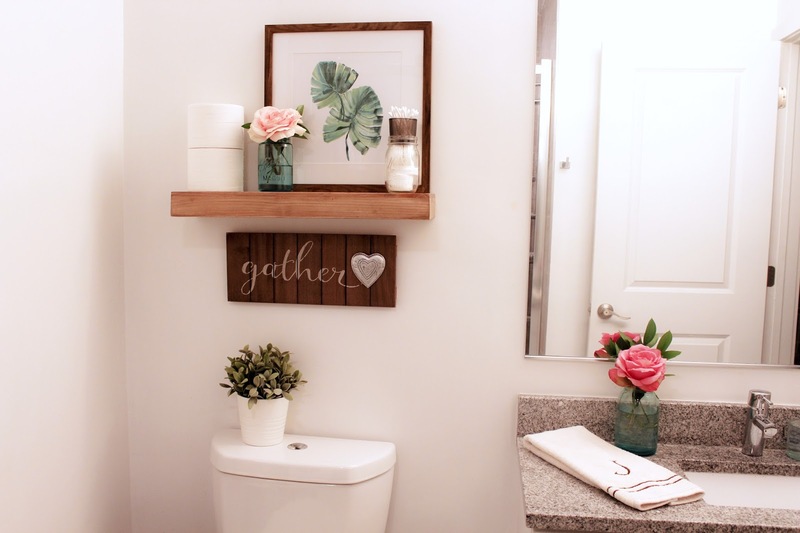 My bathroom needs a huge refresh!" Well, if you are in the same boat as I am, then you will love what is to come! 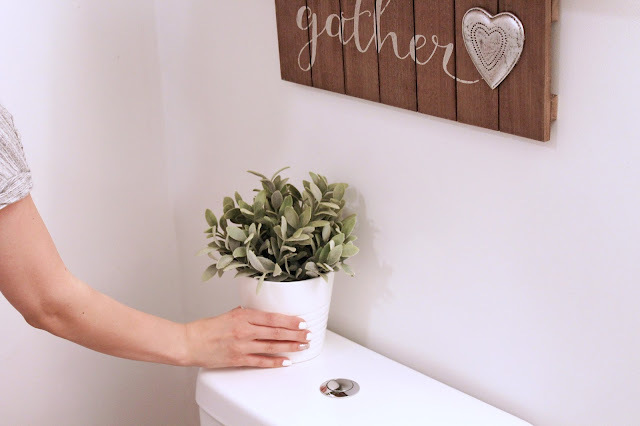 I am teaming up with Quilted NorthernⓇ to show you simple bathroom updates that make a huge difference. 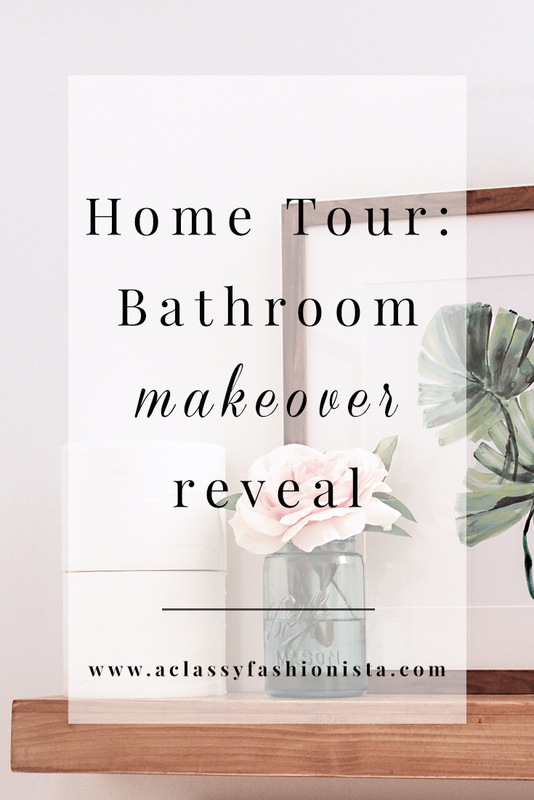 I am SO excited for this reveal that it almost pains me to show you the before pictures. But, you have to see how it looked before to appreciate this amazing transformation. I can't believe I was happy with this decor! What was I thinking?! Everything just blended into the wall and got lost. I went through a time where all I wanted was white on white on white. 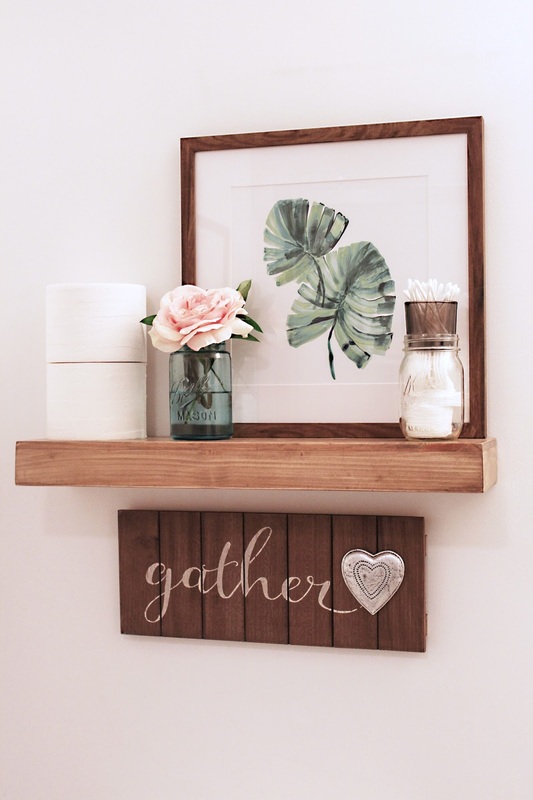 Well, now that I've got my hubby's decor opinions (PTL! ), I've been wanting to add in some texture and colors. If you read my post: Home Decor // Master Bedroom, you know that Chris and I are going for a farmhouse glam theme. We currently live in an apartment, but we want it to be as homey as possible until our lease is up next year, and we can *fingers crossed* buy a house! 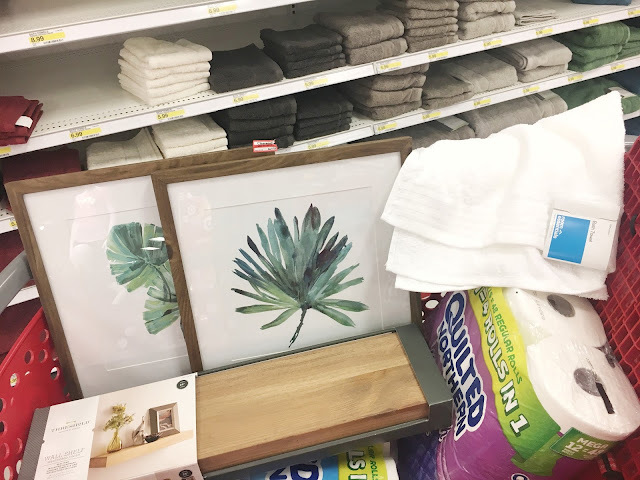 So here is my shopping cart full of goodies from Target for my bathroom refresh! 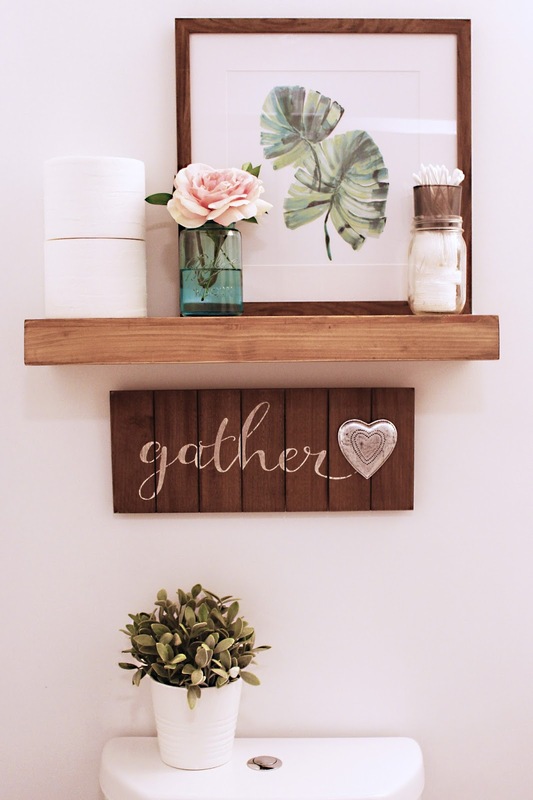 I found the cutest wooden framed prints in the clearance section (here & here), a floating wood shelf (here), a new bright white towel (here), and of course, the softest toilet paper in the whole wide world, Quilted Northern Ultra Soft & StrongⓇ Mega Rolls & Quilted Northern Ultra PlushⓇ Mega Rolls. P.S. 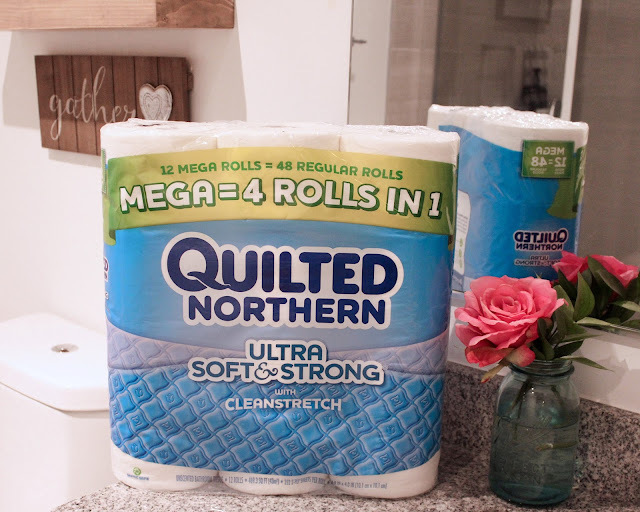 Click here for 10% off Quilted NorthernⓇ Mega Rolls at Target through the Cartwheel App! 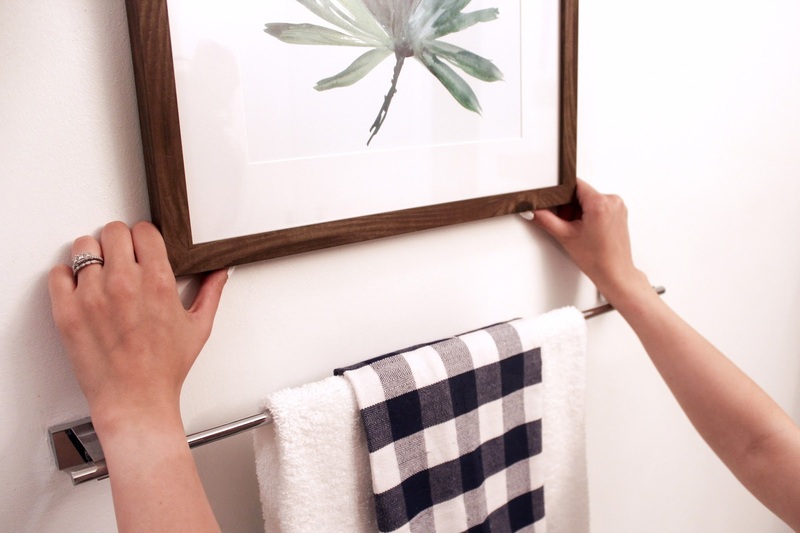 First, I hung up one of my framed prints above the towel rack. That wall is the first wall you see when you walk in, and it was so plain and needed a little art work. 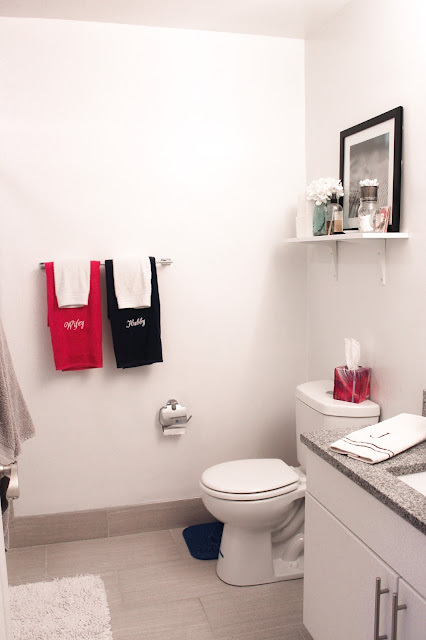 Next, I added my new towel to the towel rack and a cloth napkin I had picked up in the dollar section at Target a couple of months ago for a little pop! Plus, the pattern is perfect for the farmhouse theme. I then measured and mounted my shelf. I was really happy with the quality of this shelf for the price. Target for the win! 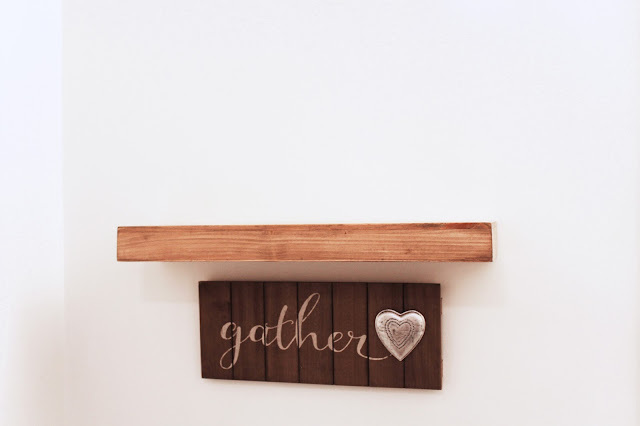 So, I wasn't planning on using the gather sign, but since my last shelf had two screw holes, it left a mess in the wall. Oops. SO, I grabbed this sign from my spare room to help cover the holes! Now it's time for the fun part! Styling. I put up the frame first, and then added in function and style. I love my mason jars. I used a vintage blue one for flowers, (which you would totally never know that pink one is fake! The Ruscus is real, though. It's still left over from my wedding!) 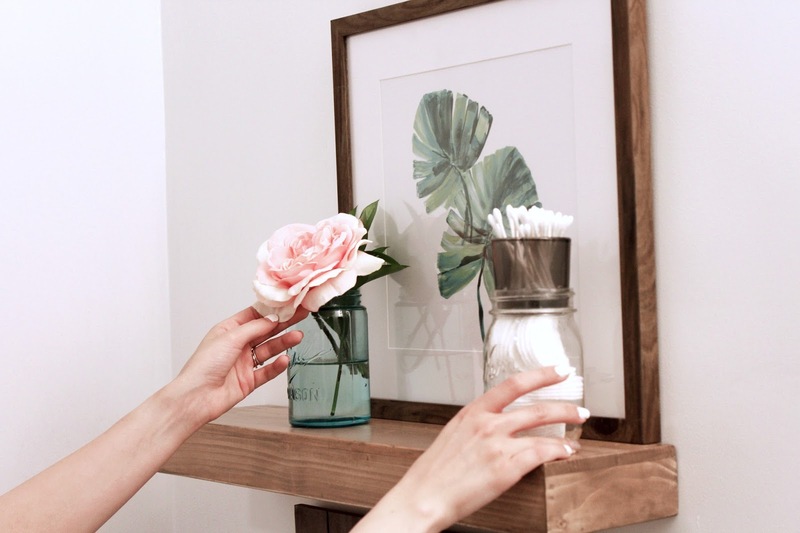 and then I kept my clear one the same for my cotton rounds & Q-Tips. 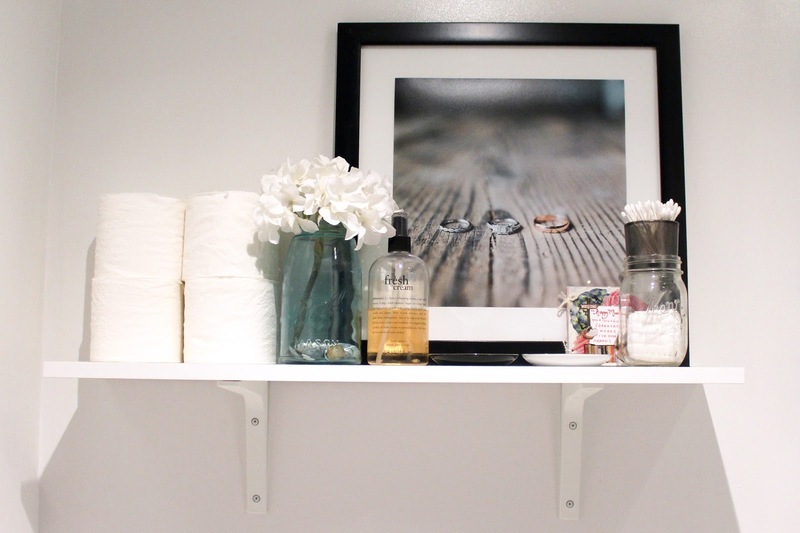 Every bathroom needs a toilet paper stack. 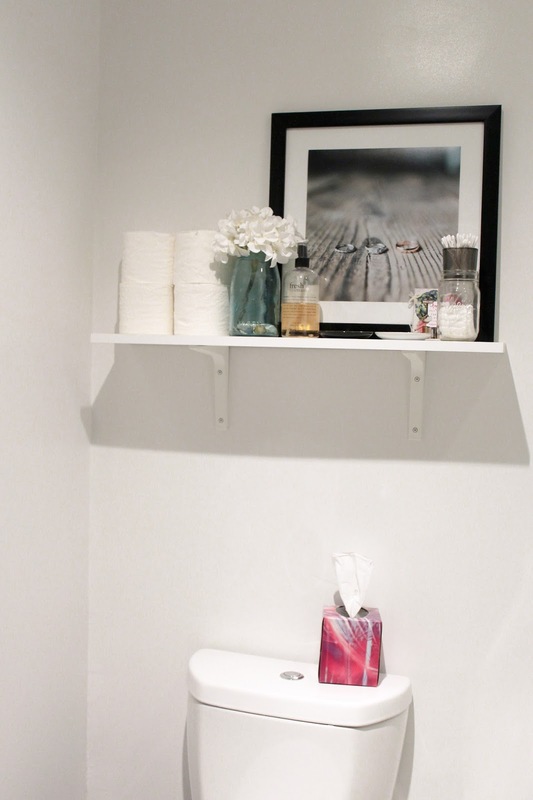 I always want to make sure that I have enough toilet paper out, especially when I am having guests over. The awesome thing about Quilted NorthernⓇ Mega Rolls is that one roll equals four normal rolls. 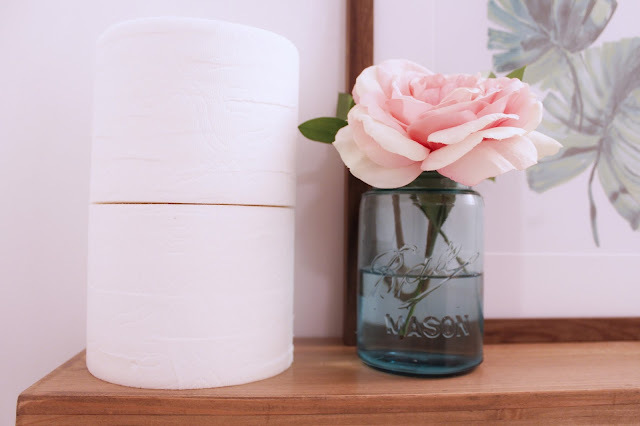 Instead of stacking them sky high to make sure I have enough, having just two rolls (which is way more appealing) will surely last through a party or a weekend visit from the parents! This makes one less thing to worry about once guests start to arrive. 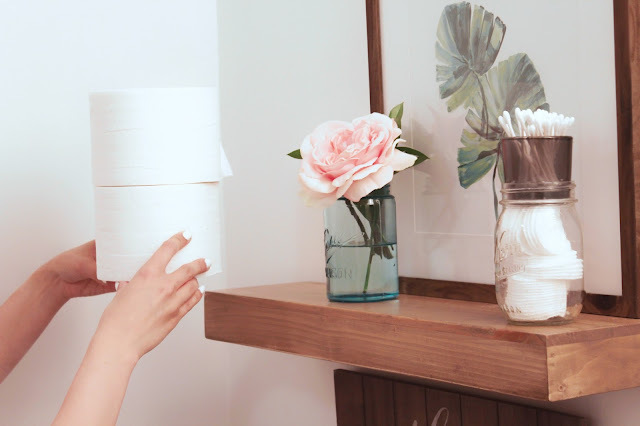 The last thing you want is your guests to run out of toilet paper! If you want to pick up some Quilted Northern Mega Rolls, I found mine in the Household Supplies aisle at Target. 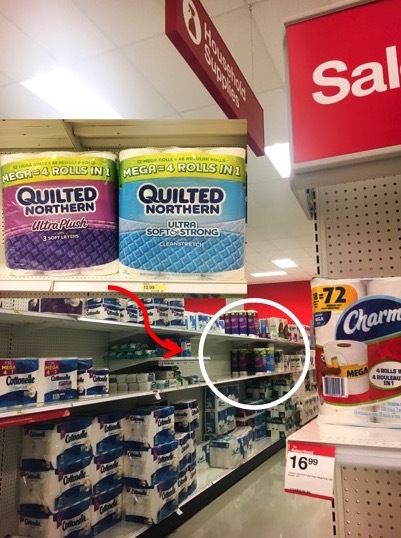 If you're a frequent shopper at Target, like I am, then you already have the amazing Cartwheel app, but if you don't, be sure to download it because during the next few weeks (6/20-7/8), you will be able to save 10% on Quilted Northern Mega Toilet Paper. Click here for the Cartwheel deal! If you want to stock up for the Summertime, if you buy three packs of Quilted Northern Mega Toilet Paper, you will get a $5 Target Gift Card! (Deal valid 6/18-6/24). Want a chance to win some $$$?! Quilted Northern has the cutest characters: Little Miss Puffy Tail, Daddy Gator & Sir Froggy. I modeled my refresh after Little Miss Puffy Tail--a country getaway. Vote on your favorite Quilted Northern character-inspired bathroom [Daddy Gator, Little Miss Puffy Tail & Sir Froggy] for a chance to win a $1,000 Grand Prize or $250 Target Gift Card! Sweepstakes runs from 6/19-8/1. Click here or below to vote and be entered to win! 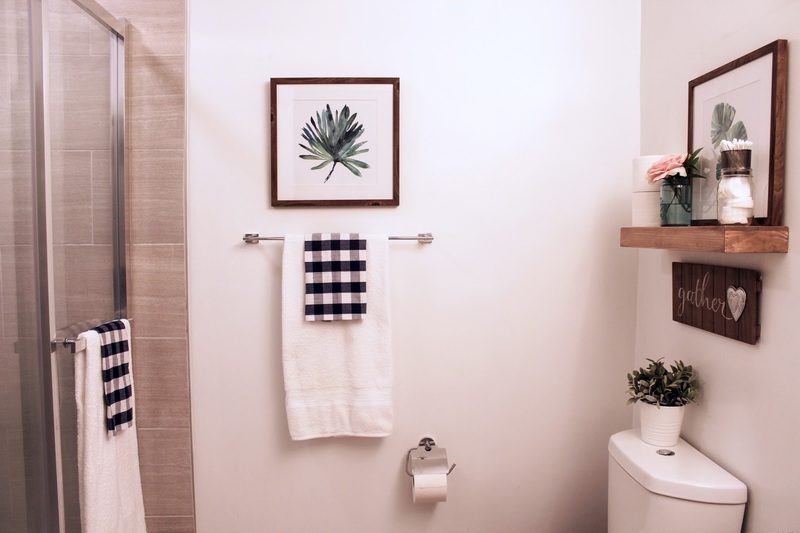 What bathroom style is your favorite?